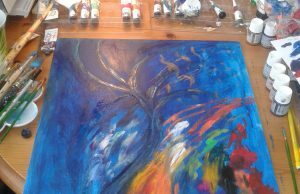 As an energy therapist and artist I offer you a customised experience, i.e. healing services and tools to suit your pace of life, interests and views of the world. I create Bespoke Colour Art to nourish your soul by making your supportive energies visible, therefore more accessible to you through colours. Have yours done or get one for one of your loved ones! 1. I gather the information I need from you for the colour reading and creating the artwork. It’s done via email or Skype call, whichever you prefer. So when I work with you, during a colour reading session, I find out about your relationship with colours. They say a lot about your energy system. Based on my findings, I create an artwork for you, incorporating colours that are customised to your unique energy set up, therefore act as an “energy capsule” to shift your energies positively. 2. You pay via PayPal or bank transfer. 3. When I have received payment I make the art and I type up a full colour reading for you. 4. I post it all to you. Price starts from £195 + postage, depends on size (small approx 20cm x 25cm). Artwork can be done in 3-5 days + delivery time. Please contact me via email, if you wish to have yours done either to arrange a phone call or to keep conversing via email regarding your art.